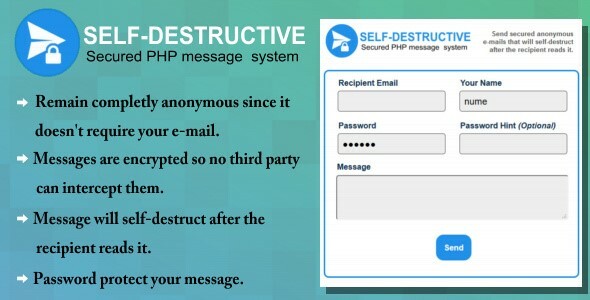 Self-Destruct E-mail message system - CODELISTPRO | Free Premium Scripts, Plugins, Apps Source Code. This script will let you send secured e-mails that will self-destruct after the recipient reads it. It’s a secured system and it’s easily to implement and expand based on your needs. You will be able to hide your identity aswell since it doesn’t require your e-mail to use it and you can also password-protect your message so you will be sure the recipient it’s the ONLY person that reads your message.